I have just uploaded a video about a rare Jennings Witch. I discuss how to identify the fakes as well as how the self loading jackpot works. 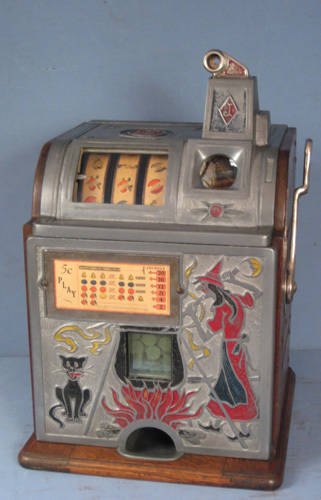 FYI, the Witch and all the Victoria (Model B) machines had a unique feature where the operator could specify how many coins the machine would load into the jackpot. Original Witch's come up for sale so rarely it is hard to know what true market value is. The reproductions really screwed things up. When the one that sold back in 2006 brought $17,000 the fakes really started hitting the auctions. The one on eBay has been restored (all originals are much more desirable) and also has a reproduction bottom back door. Both of these are pretty big deals to people who are willing to pay top dollar and want 100% original machines. To me $8,500 does not seem out of line. I sure wouldn't sell mine for that but mine is 100% original and I have been told the nicest original known. I sold mine for $2300. back in 99. Last I heard it's somewhere around Cleveland #100024.